Best steak in central Texas. Great ribs, Great BBQ, All the food is Great. Good prices. Just off of I20 in Eastland County. The restaurant is located in the Texas Cattle Exchange. Great food...if you get there early. Some of the best vinegar based Bbq I've had but they always run out of thimgs early. Especially ribs and chicken. I travel a lot all over the south, from VA to FL and all over TX and LA and in between. The BBQ here was moist, smokey and very flavorful. They have different kinds for different palettes. 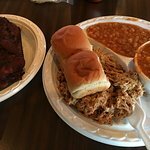 Get quick answers from Circle M BBQ staff and past visitors.